A sequence of issues has ended up bricking(?) my PC. I assume this a BIOS issue but I am not sure. I'd be very grateful to anyone who could help me resolve this problem, or even just explain why this has happened if a solution is not available. Not long after logging in to Windows my pc crashed displaying a gray screen with lighter gray vertical stripes. I turned off the pc by holding the power button however when restarting the pc it would display a black screen after the windows loading screen. (I later realised that during this time the motherboard manufacturer screen was not displaying before the windows loading screen). I checked my display and gpu drivers, they were up to date. Also my monitor is fine as I tested it with other devices. I ran a sfc /scannow command which came up saying there were some issues that it could not restore. After this I decided that my BIOS was corrupted and attempted to clear the CMOS. This did not work and has appeared to make the situation worse as now when I power on I am instantly shown the blue and pink screen. However my keyboard and mouse are lighting up and all the fans are spinning on the components. The only video output I have is through my graphics card. This has me wishfully thinking that maybe the motherboard and BIOS are fine however the gpu is not displaying them correctly and the screen I'm supposed to be seeing is the bios setup screen. However I am likely wrong. Please if any knows how I can fix this, the help would be greatly appreciated. Sounds like a gpu issue. If you go into the bios is is corrupted. I appreciate the reply but that really isn't very helpful. Could you expand on that? Thanks. Can you go into your bios by pressing delete or f2 at boot? Is it corrupted there? Im assuming you don't have onboard graphics? What is the motherboard chipset? 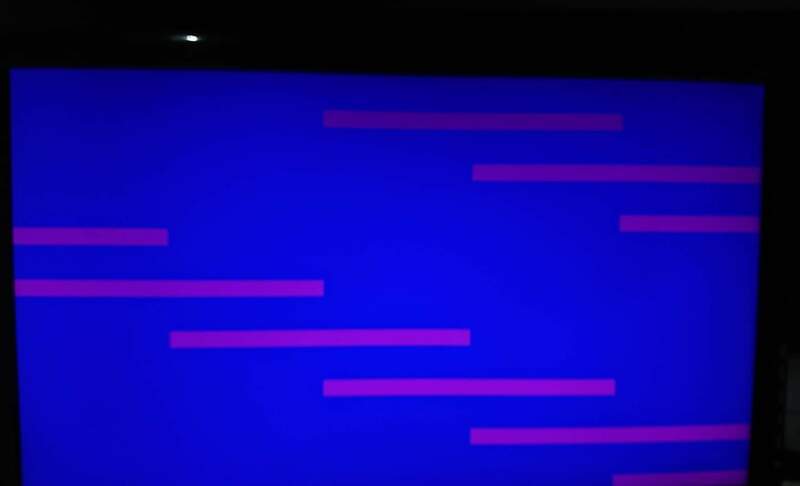 The blue and pink screen in the original question is what I saw when I tried to access the BIOS. Now, after resetting the Cmos, this all I see instantly when I power on my pc. I don't have onboard graphics. I don't know about the motherboard chipset sorry, all I know is that it is a gigabyte am3+ motherboard. Ok. I would say your video card is dying but since you have no onboard gpu you will need another pc. Can you put the gpu in another pc to see if it does the same. Id also chect the monito with another pc. Turns out it was a gpu problem, I borrowed a friend's gpu and the pc works fine. Thanks for your help! Your welcome. There isnt a lot to do to fix a faulty gpu that acts like that other than temporary bandaids. Id suggest buying another gpu. I had the same issue with one of my older pc's.. Turned out the video card went bad, so remix is probably right. I would remove the card and see if the card works in another pc. If not, well you have answer.. If it does, post findings so it can be looked into more. 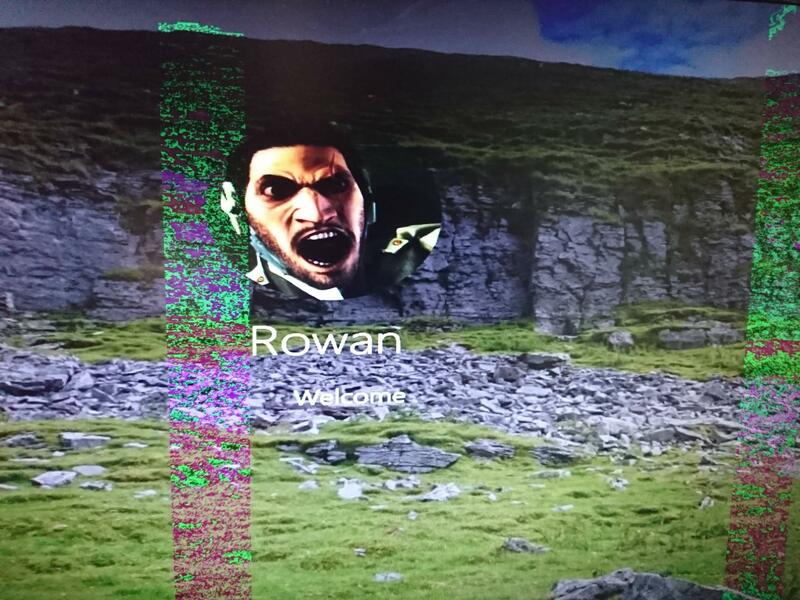 Various display glitches and crashes leading up to PC not booting.